Hi Alisha, thanks for sending this in and congratulations on your vocals, this isn’t an easy song! I reckon there are a couple of things you could put in place that would really lift this video, without you having to do anything differently at all. The room that you chose to use to record in has a very bright acoustic; from what we can see it has several hard surfaces that are bouncing the sound right back at us. This isn’t really helping you as you have a strong, bright voice plus you are going through some sort of desk, does it have any built in reverb settings? If it is just amplifying your voice then you might want to think about getting a separate effects pedal, or recording without a hand held mic in a different room. For me there isn’t quite enough light and shade, try starting quieter, really think about the intimacy of the opening lyric, this will also give you somewhere to go. There are a few points in here where your agility isn’t quite matching up to what you want your voice to do (‘day’ at 15 seconds) and you sort of slide through a riff instead of getting every note exactly right – do a few agility exercises with a metronome, increasing the tempo bit by bit, to get your voice moving faster with accuracy, and those moments will sound much more crisp, but well done and thanks for submitting. My name is Alisha! 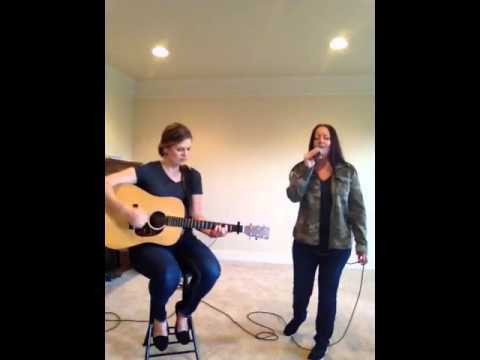 I started taking voice lessons with my voice coach Martha (playing the guitar) last February of 2014. I’ve enjoyed every moment of it and learning so much from her! We did this video for fun and entertainment. I am a full time nursing student and also work full time in the operating room. Hope you enjoy!